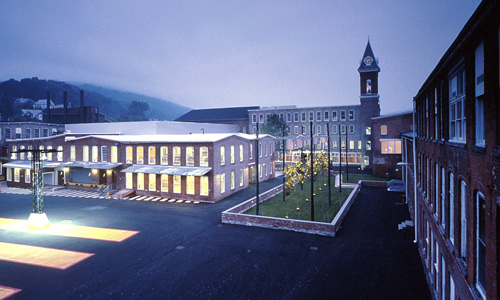 There’s been quite a brouhaha over an installation piece commissioned from Swiss artist Christoph Büchel by the Massachussetts Museum of Contemporary Art (MASS MoCA) in North Adams. 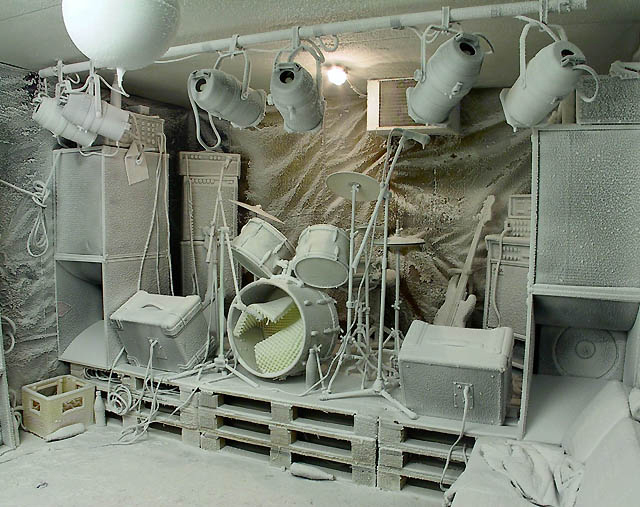 Swiss artist Christoph Büchel creates hyper-realistic environments that are, in essence, like walking into a mind at work. His detailed installations are three-dimensional renderings of interior spaces and/or situations that often convey extreme psychological mindsets, such as that of a survivalist, a homeless person, or an agoraphobe. These fictitious yet highly believable environments – rooms within rooms – are carefully constructed so that the institutional framework of the art museum and all reference to the gallery context are removed. A complexity is found in the elaborate detail the artist develops for each project, an artistic sensibility that allows layers of social and political commentary to permeate within a uniquely contemplative space. Büchel locates contradictions and social inequities in the ideological forces dominating society today (global capitalism, unprincipled consumption, religious conservatism, American hegemony) and finds a way through his work to satirize, demystify, and resist these forces by revealing them as constructed realities subject to change. MASS MoCA exhibits work by many of the most important artists of today—both well known, and emerging—focusing on large-scale and complex installations that are impossible to realize in conventional museums. Our broad, soaring galleries with 110,000 square feet of open, flexible space and their robust industrial character have proven both inspiring and empowering to artists. A blog post by Jake Oldershaw of the UK was interesting – and he actually toured some of Buchel’s other works. The NY Times had quite a bit to say on May 22, 2007. As did the Boston Globe. The upshot is, if I understand the whole convoluted mess correctly, the museum commissioned Buchel to create an installation, entitled Training Ground for Democracy, to open in December last year. The scale of this museum is mammoth, the gallery it was planned for is as large or larger than a football field. I’ve been there and it’s a tremendously huge space. The space was to be completely filled with items of the artist’s choosing and such things as an entire two-story house, a tanker truck and a tollbooth were brought in. Hundreds of local people contributed many of the smaller items that were requested. There was no formal contract, although the museum claims to have email correspondence where the budget and the timeline was discussed. The artist asked for more and more outrageous items for the installation and finally, after spending twice the budget they had planned for, the museum said enough. I believe this was right after an additional list of required items appeared from the artist that included the burned fuselage of a 767 airliner to be hung from the ceiling. The museum wanted to open the show to recoup some of its investment and to keep its patrons happy, the artist stated the work was incomplete and he refused to allow it to be shown. The museum opened the show with all of the exhibition components hidden under tarps, but with photos of the installation process shown. The artist sued and the exhibition is in limbo. Was this all completely deliberate on the part of the artist to see how far he could push an established museum in a wealthy country (the subject of the exhibition in fact) as commentary on the state of contemporary art today? Would this statement then be his “art”? If this is the case, and they had in fact somehow acquired the burned fuselage of an enormous airplane (and where do you go to buy one of those anyway?? ), would he have asked for the Statue of Liberty next? If this was deliberate, how will Buchel top it? Where does he go from here? How would he go back to his previous work, and how hard will it be to find a venue in the future? Was the museum’s response correct? Both in ending the project and in opening the show without the artist’s consent? Do you agree or disagree with their decision? And doesn’t the opening of an unfinished exhibit, covered with tarps, also speak to the state of contemporary art today and the relationships of artists and venues? Should a venue be allowed to display unfinished work against an artist’s wishes? Has the entire thing, — the artist, the museum, their respective actions and reactions, become conceptual art? Is a large-scale installation like this a collaboration between a museum and an artist, and if it is should both parties have equal voice in it’s resolution? Does the artist have a responsibility to the museum, based on their investment in time, space and money, to complete the work? Or at least “sign off” on it? Does the museum have a right to declare an installation “finished” and exhibit it? bully, the camera pans back, and Hogan is in a thong slapping his thigh. There are so many different providers to choose from. The museum, the artist and the wide-eyed masses prepared to pay homage to this anticipated commissioned work – each of them showing a mix of pretension, arrogance and naivite, to some degree. The winners, as usual, will be the lawyers. In California he would be hard up to get the funding. Our state has stopped funding the “ARTS” to all schools and cut way back if not shut down for commerical ventures. If you want to do much here you need to provide $$$$. The Arts Councils are struggling and the museums are working at keeping patrons happy. The San Francisco Museums of Modern Arts is fairly new and has some wonderful works but a lot of it is on loan. Sign of the times here. It would be interesting to see a copy of the contract between the two of them. I think the museum was in the right to stop the funding — you can only push so far before the doors slams shut. While these difficulties definitely have a 21st century twist (I’m thinking of the exhibit-as-process as well as the VARA act), brouhahas over cost overruns and incomplete work goes way back — I’m remembering Michael Angelo and Rembrandt in various contretemps over needing more money to complete work they promised would be done some years before. My memory says that marble (quality and shipment questions) was involved in one big fight and finishing some Cathedral doors in another. Both men seemed to take on multiple commissions, abandoning one for another when they ran into trouble. And fighting with their patrons as they took other work. It will be very interesting to see how this plays out in court. Buchel’s attorneys are planning to invoke the VARA act, even though the work isn’t completed. I think you can bet that every artist dealing with MASS MoCA from now on will be signing a heavy-duty, multi-page contract. And other museums and galleries that work with installation artists are probably reviewing their standard contracts as well. Super inforamtive writing; keep it up. If I’ve read these articles correctly, this incredibly enormous art work was supposed to be pulled together in just a few months time. Given the nature of (the little bit you can see in the photos) Bruechel’s work, I can’t believe that anyone thought it could be pulled off so fast. It’s the museum’s problem, I think; they ought to have had a contract. I simply cannot blame Bruechel, he alone will know when it is finished, assuming a *finis* is possible. Allowing him his space could be the difference between kitsch and art. Surely it takes time for the layers to accumulate properly; perhaps Bruechel himself didn’t realize what it meant to produce an epic of art in terms of time and money. And how difficult to work in the creative framework when being incessently pressured about money. My admiration for Christo and Jean-Claude is increased. Perhaps Breuchel could take a lesson in preparedness from their experiences. His work seems like an art house of the haunted. A pox on both their houses? The first thing that hit me was the question of whether Buechel was pushing an established museum in a wealthy country to make a point or not. I wondered, if he wanted to attack a wealthy country, why not stay home and attack his own? Switzerland isn’t exactly asking the World Bank for handouts. Which then leads me to believe that if he’s doing this deliberately, his attack (and therefore a major part of his statement) is pointed directly at the US. Just food for thought. As for where ho could go from here, I imagine he’ll find it hard to get work in the US, but that may just endear him more to other countries, so maybe it’s a wash.
It’s hard to say whether the museum’s response or Buechel’s is the correct one. There just isn’t enough information in the articles given. Like Clairan, I’m surprised that the Museum didn’t have an ironclad, signed agreement, but then again, maybe they thought what they had WAS just such an agreement. I’m also suprised that the instalation was funded entirely by the museum. I don’t know much about how these things work, but I was under the impression that part of the proposal an artist makes to a venue very often includes how the artist and/or venue could obtain a certain amount of funding from outside. That aside, if the museum gave Buechel even “about $160,000” and a finish date, then it’s the artist’s responsibility to be sensitive to that (expenditures double that amaount plus requests for more is NOT sensitive). If he thinks he can get a two story house and a jet fusilage for a better price than the museum did, then he should share his sources with them. I am inclined to side with the museum’s point of view. When the well runs dry, it is dry. Based on MASS MoCA’s web site, it sounds like they are NOT showing Bruechel’s artwork, they are showing an exhibit about process. That changes the context of the installation and makes it no longer Bruechel’s artwork, but something else that contains elements from his artwork. It’s arguably an underhanded collaboration. However, Bruechel led them into the predicament. As my parents always said, “Two wrongs don’t make a right,” but I’m not sure what I would have done in the same situation. The museum has salaries, insurance, etc to pay. I’m sure the lawyers for both sides will have a field day with this to the detriment of artists and museums/galleries alike. I’m going to think out loud here because I think this is a very convoluted situation. After reading about what happened, I think (and I’m surprised by this thinking — so way in here anyone with alternatives!) I’d have to side with the museum against the artist — even if I think (politically) making rich people, even those who believe they are on the side of the angels, realize that we’re all in this mess together is completely valid and a difficult point to make artistically — because if you take it to the extremes that Buchel has, then there simply won’t be any art in museums anymore. Now I realize that may BE his point; he may want to be rid of the separation between art and life, etc., but I think there is a place for public art, and right now that space includes museums. By the way, I can’t believe the museum didn’t have an iron clad contract with him.